While studying the Earth I was interested in the layers starting at the center. First there is the inner core, then the outer core, the mantel and the crust. Even the Earth itself is one huge Mandala. As I sit in meditation during or after a yoga session I picture my own center, or my core. What moves me, inspires me , motivates me, excites me? It starts there, in the center, and grows into an idea, My thoughts provide the design for the other layers of feeling that prompt me to action. What am I talking about? An idea starts somewhere. In the core of our best self. We are inspired by our source of life. I believe that is God. Why do we do what we do? Why do we believe what we believe? Because deep within ourselves there is a seed of thought just waiting for our okay to be born. Once our idea gets to the action stage it leaves the security of the crust and jumps to the atmosphere. A creative action takes flight. A virtual Mandala is created, we are ready to flourish. 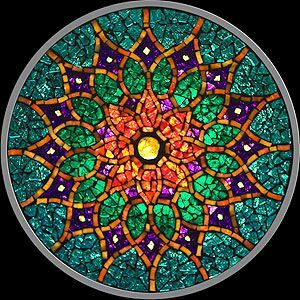 Whether we are attempting a new yoga pose, designing a new stained glass window or just beginning a new day, we are reaching within ourselves and creating something beautiful. Just a thought.